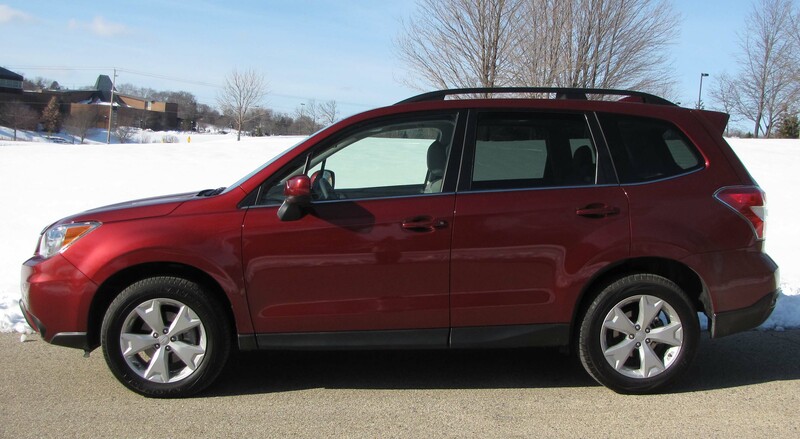 Subaru’s Forester remains one of my favorite small SUVs because of its handling, spunky power, smooth CVT, quiet interior and sure-footed AWD capability. That doesn’t even get at its other attributes, like reasonable starting price, good gas mileage, comfortable interior, top-notch safety rating and its overall usefulness. The Forester was redesigned for 2014 and just keeps getting better with little tweaks. The handsome metallic (Venetian) red test model was the mid-level Limited that includes leather seats, an automatic climate control system, and power hatch. Like its stablemates (there are four trims, plus the XT models that include a gutsier 2.0-liter turbocharged engine), the Limited delivers good interior space with wide comfortable seats and one of the quieter small SUV interiors. The 2.5-liter boxer (horizontally-opposed) 4-cylinder engine is strong, delivering 170 horsepower and 174 ft.-lbs. of torque. While some small SUVs and crossovers may offer more pony power, few feel as spunky as this Subaru engine. Touch the gas pedal and the Forester jumps away from stoplights. In fact, it takes a couple days to get the feel of the pedal. You can startle yourself a bit the first few times you accelerate. Part of that pep comes from the smooth linkage of the boxer engine (same layout as Porsche engines) to Subaru’s CVT. This automatic continuously variable transmission is one of the best on the market, smooth and efficient. In fact, the test ute was rated at 24 mpg city and 32 mpg highway, considerably better than the manual-transmission-equipped base model, the 2.5i. For the record I got 26.4 mpg in my test, which was about an even mix of city and highway miles. I know that at less than $2 a gallon for gas many of us are less concerned about mpg of late, but what goes down, must come back up. Forester’s handling also is light and responsive. It’s electronically assisted, but still delivers good road feel, and with a sporty edge. Ride is decent too with Forester’s 103.9-inch wheelbase helping spread the bumps. There is a little chatter on particularly bumpy roads, but overall ride is fine and actually improves a bit with more people on board. 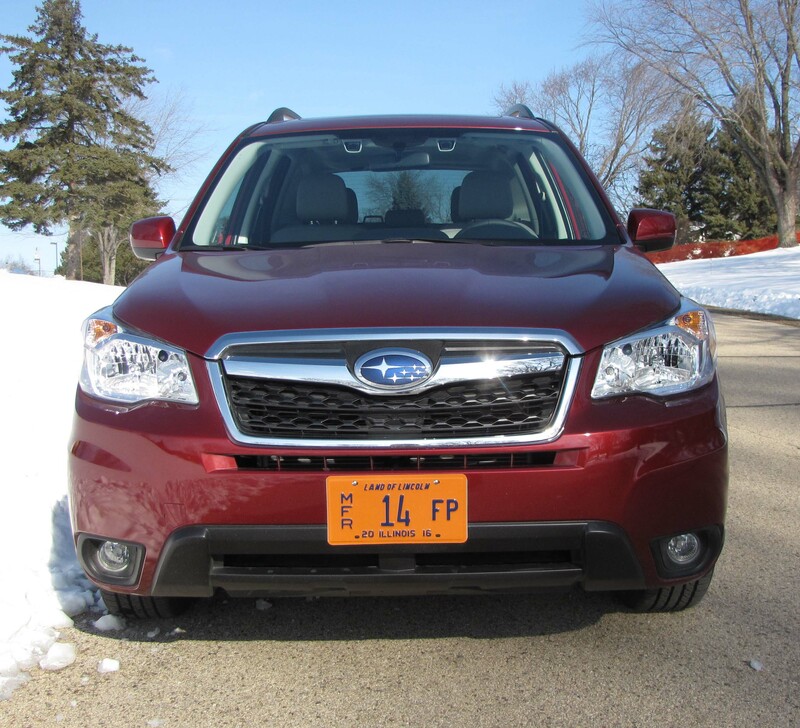 AWD is standard, even on the base Forester, and it provides good footing in snow and slush. We had snow on the side streets during my drive and I never felt the Subaru get the least bit loose during acceleration or braking. Four-wheel discs provide the stopping power and Vehicle Dynamics Control and ABS are standard. In addition to the interior being quiet, it’s well laid out and comfortable. I like flatter wider seats that are easy to get into and out of, and the Forester is accommodating. As with most Subaru seats, these are firmer than in many vehicles, but they weather well through the years. The driver’s seat has 10-way power, including power lumbar support. Rear leg and headroom is excellent making it possible to carry five adults in the Forester. The 60/40 split rear seats fold almost completely flat to boost cargo room and this model has a power hatch for easier loading, along with a cargo cover in back. Front seats are heated, two levels, but the rear seats are not heated. Also, while there’s a manual tilt/telescope steering wheel it is not heated, nor is that an option. That seems a bit out of character for Subaru, which normally is on top of the electronic goodies game. There’s another faux pas in that the test model included EyeSight, Subaru’s fine driver assist system, but it does not include a blind-spot warning system. Most vehicles offer this and it’s available on other Subaru models. EyeSight itself helps brake the car or cut its throttle if it detects a potential collision, plus includes adaptive cruise control and lane departure warnings. 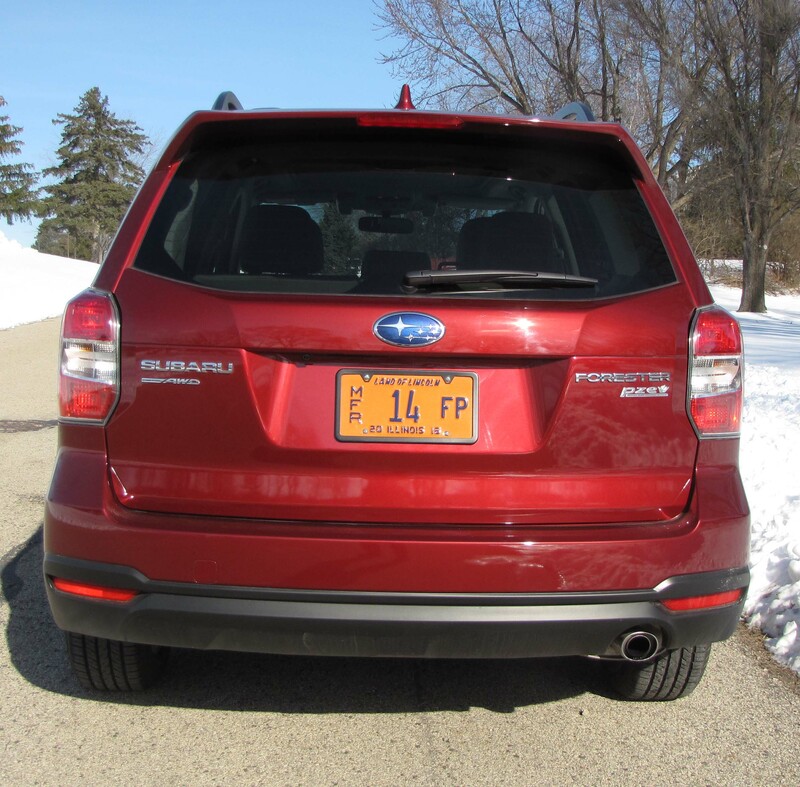 In addition, the Forester’s fog lamps aim themselves in response to steering inputs. 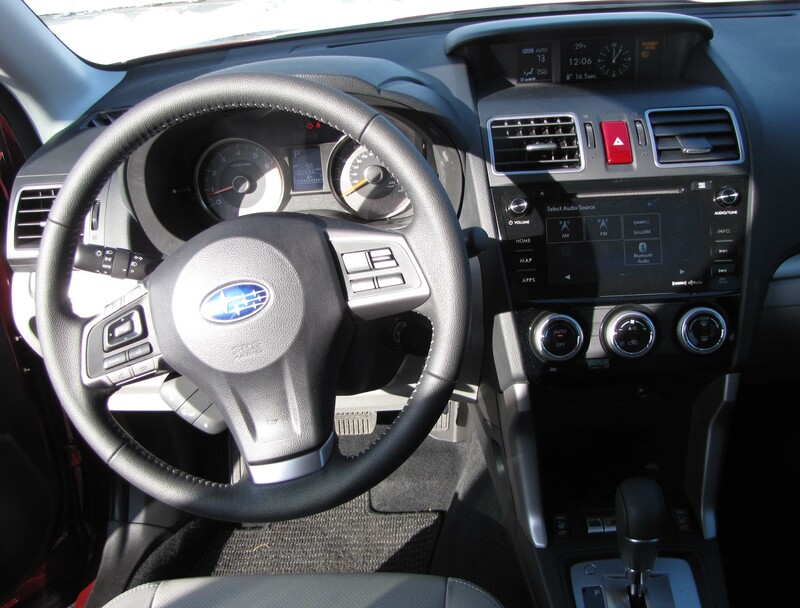 EyeSight is part of a $2,145 option package that also includes a navigation system, nice touchscreen display with smart phone connectivity, and HD radio with Sirius satellite service, and a 440-watt 8-speaker Harman/Kardon sound system. I like the 7-inch touchscreen in this and the Premium and Touring models. On-screen buttons are large and logical, plus there are a few knobs for radio tuning and volume. The automatic climate control system though was a bit slow to warm, and was slow to warm the driver’s feet on particularly cold mornings, those below 20 degrees. One of Forester’s big pluses compared with other SUVs and crossovers and frankly most sedans, is its stellar visibility. It has a tall glassy cockpit with great sight lines and thin A-pillars with exterior mirrors well positioned to allow a driver to see to the front and side of the vehicle. Other vehicle makers need to figure this out for safety’s sake. Speaking of which, Forester earned a top overall safety rating, including for frontal and side impacts. 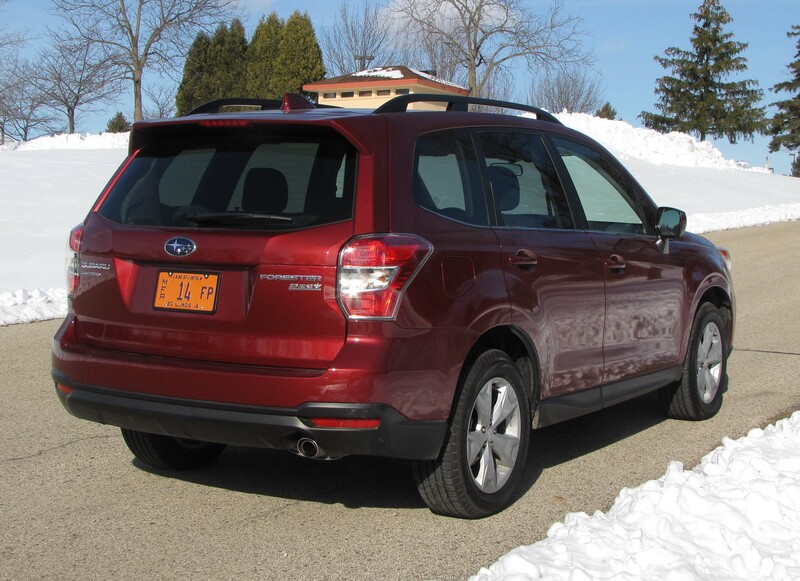 From an aesthetics standpoint and for those who love sunroofs, Forester has an extra-large one to let sun in. 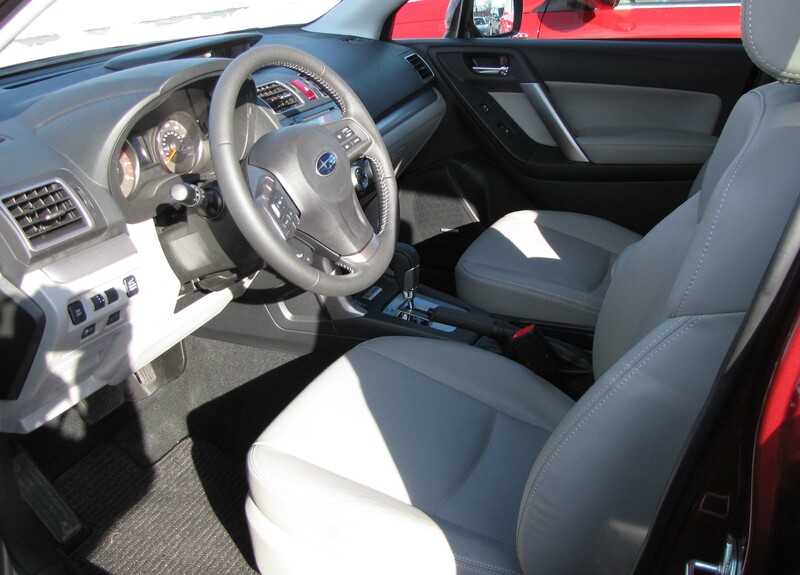 It brightens the interior, which was black over gray with gray leather seats here and matte silver dash trim. Pricing starts at $23,245 for the base model, and that includes delivery fees. The test unit started at $28,795 and with delivery fees of $850 and the option package ended up totaling $31,790. If you desire (and it’s a blast) the turbocharged 2.0 XT version with its 250 horses, the Forester starts at $34,645. The XT also upgrades to 18 inch tires from the standard 17 inchers. Moving up from the tested Limited to the Touring model boosts the starting price to $31,645 and adds HID headlights, keyless remote start, dual climate control system and electroluminescent gauges. Nice thing about the Forester is that the basic driving dynamics are the same at each level, so you only need to decide what trim and options you’ll need. I’d go for the turbo if money were no object, but a 2.5 Premium or Limited model will suit most driver’s needs, economically. Hits: Handsome small SUV with good power, excellent CVT, light and responsive handling and decent ride, plus AWD. Extra-large sunroof, heated seats, comfortable and quiet interior, good visibility, power hatch and nearly all the latest electronic bells and whistles. Rear seats fold flat for good cargo room. Misses: Heater is slow to warm feet when temps fall below 20 degrees. No heated steering wheel option either and no blind-spot warning system with EyeSight.